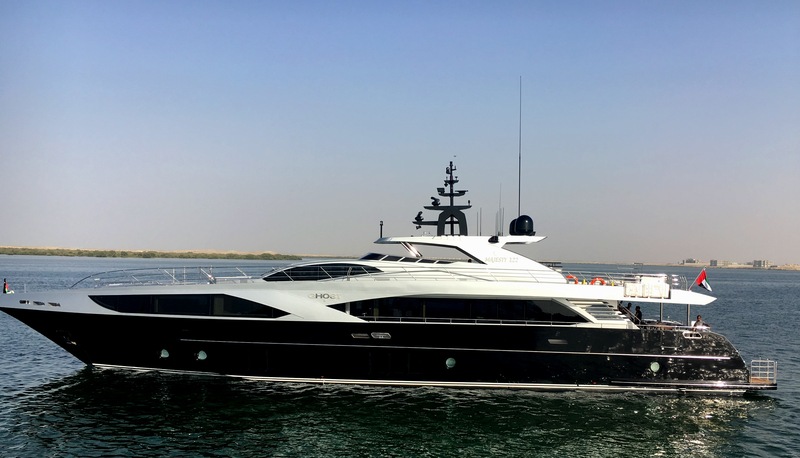 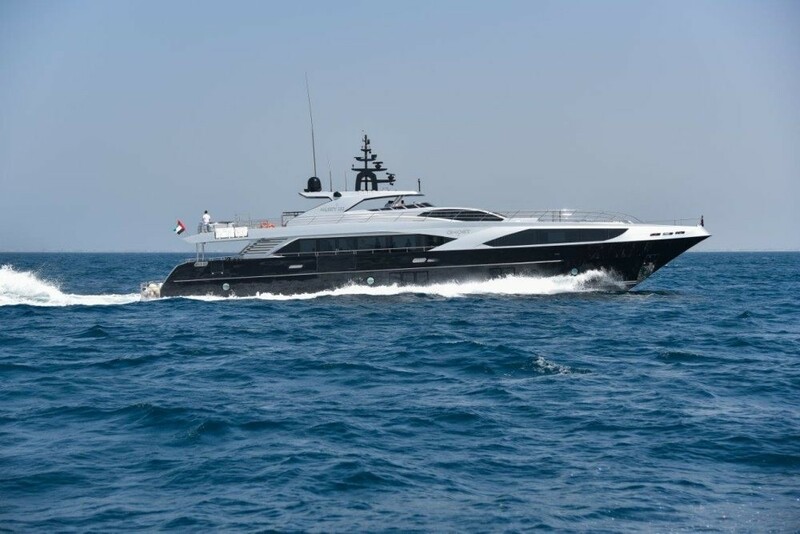 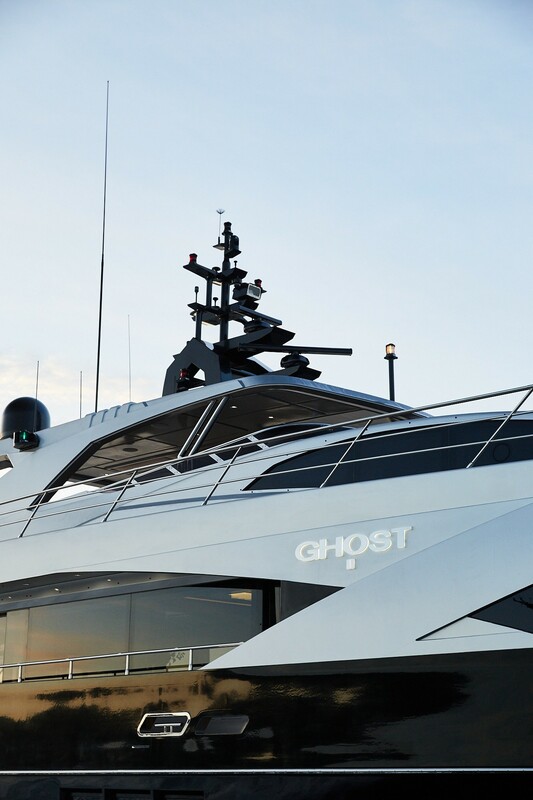 Motor yacht GHOST II was launched in 2016 by Gulf Craft and features naval architecture by Frank Muller and interior design by Frank Muller and Gulf Craft Design Studio. 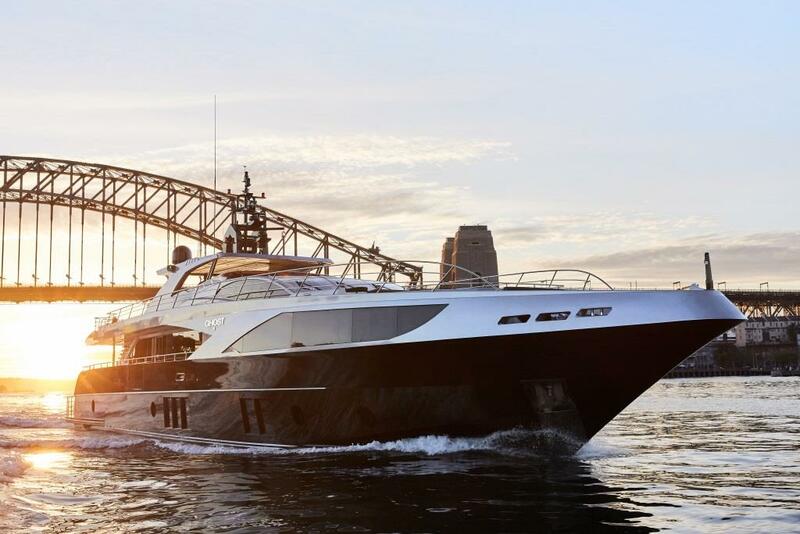 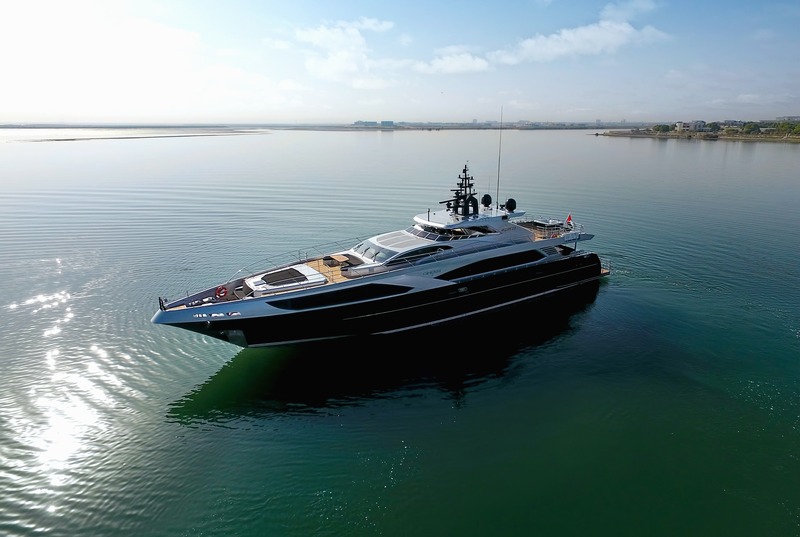 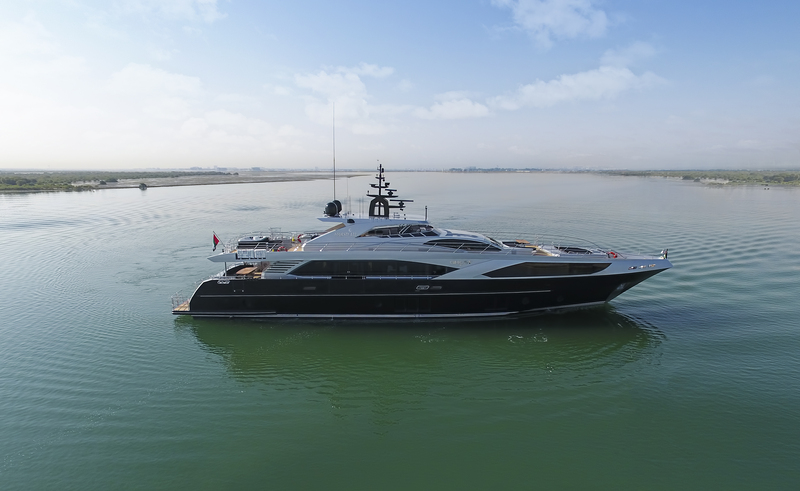 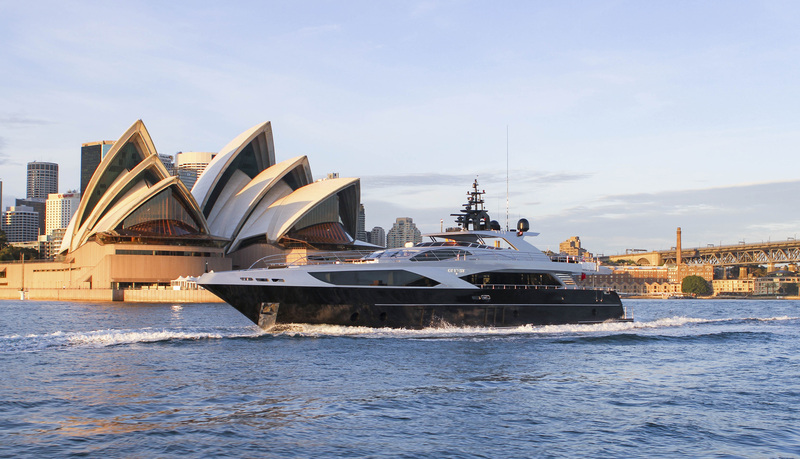 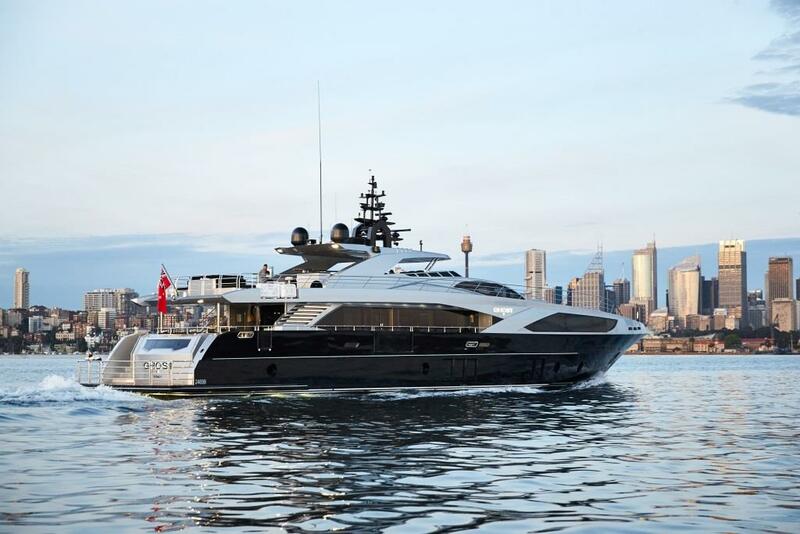 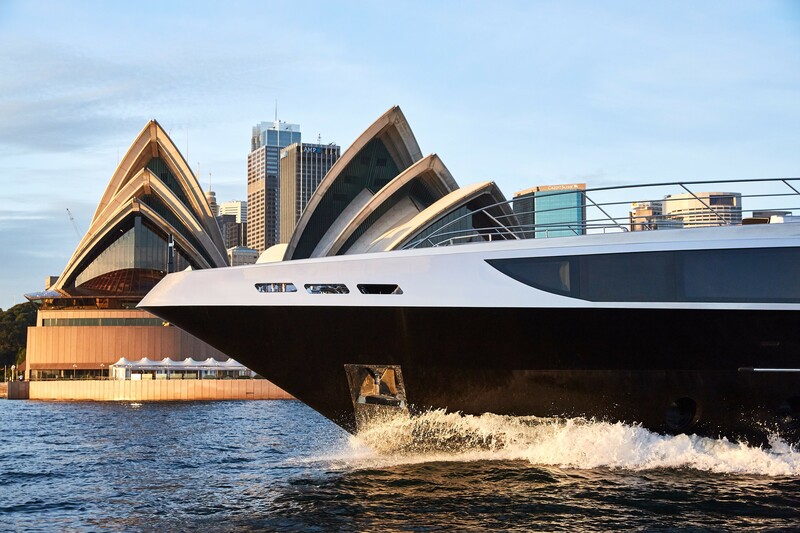 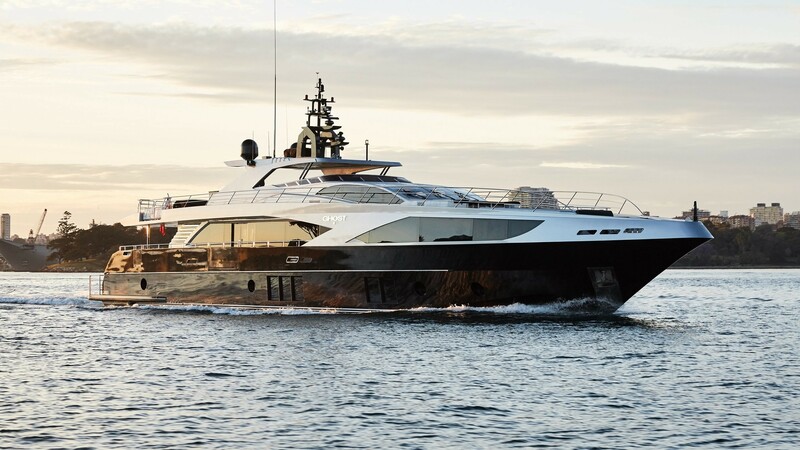 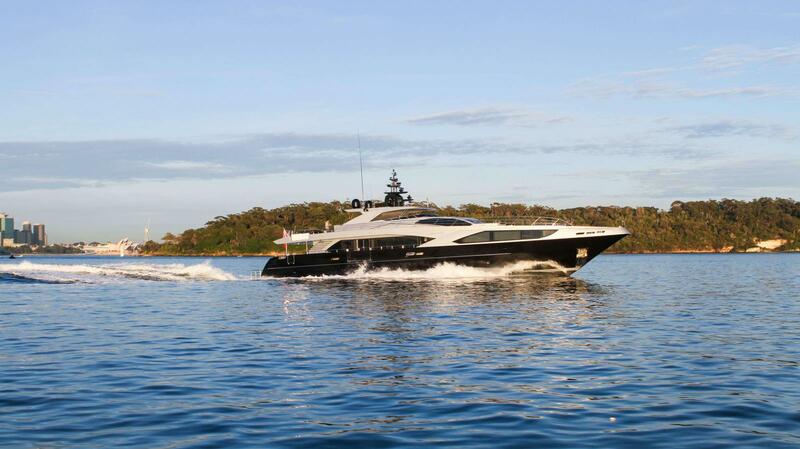 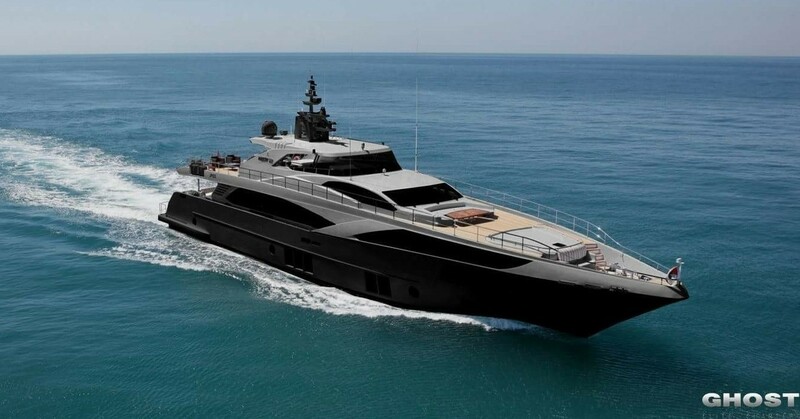 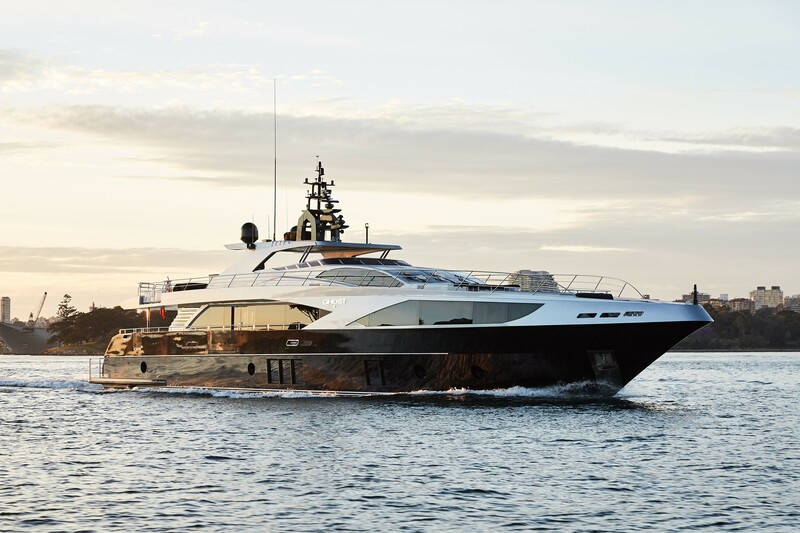 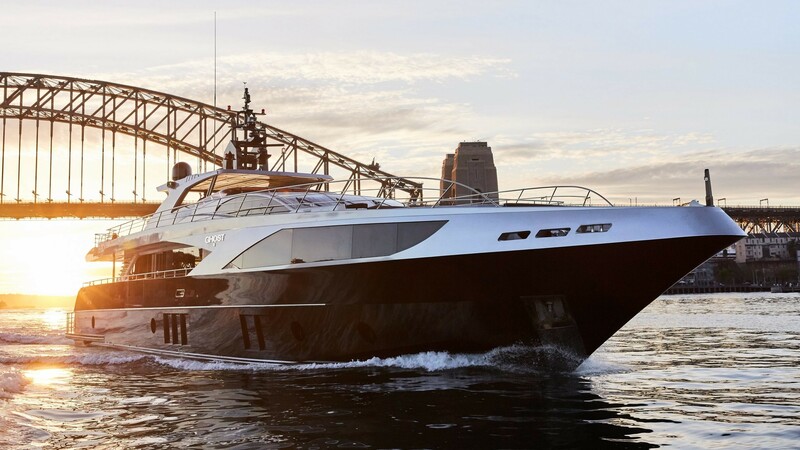 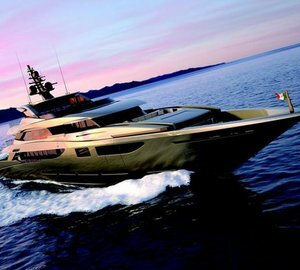 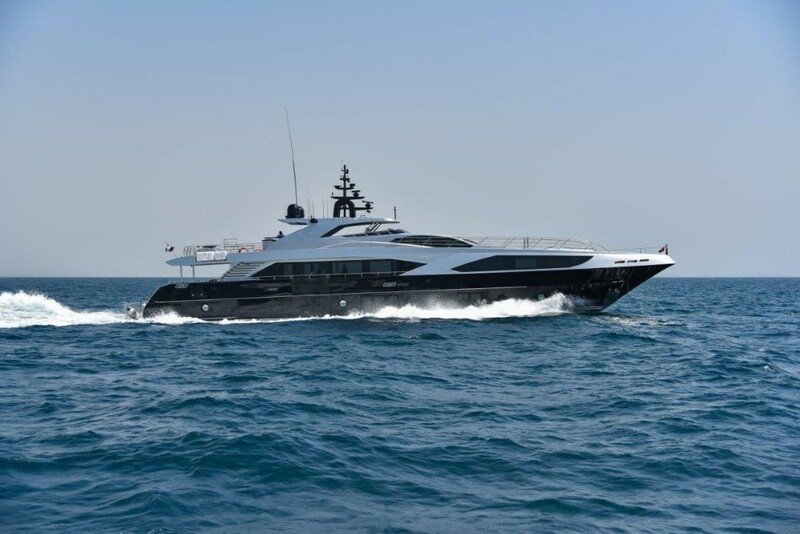 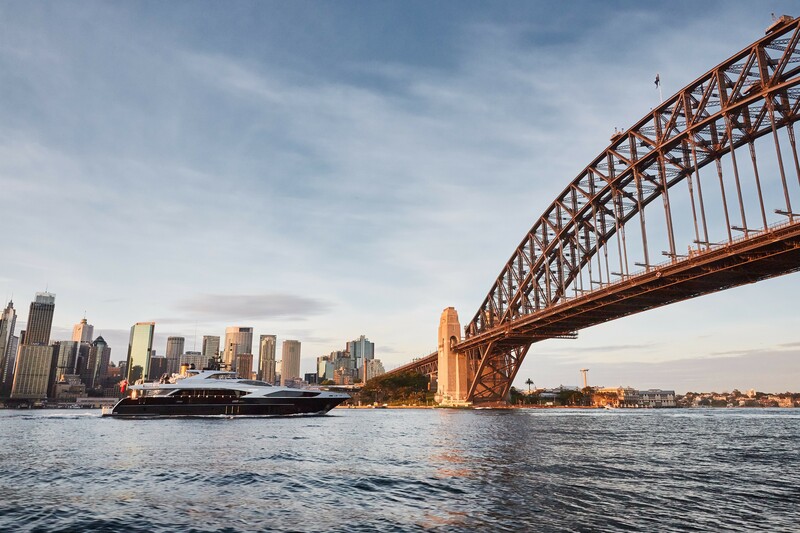 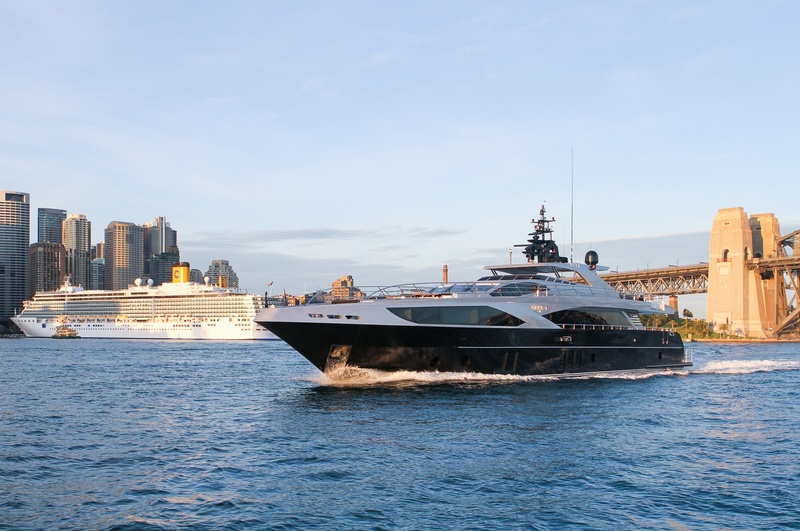 At 37,3m (122,5ft), she offers luxury charters for up to 12 guests. 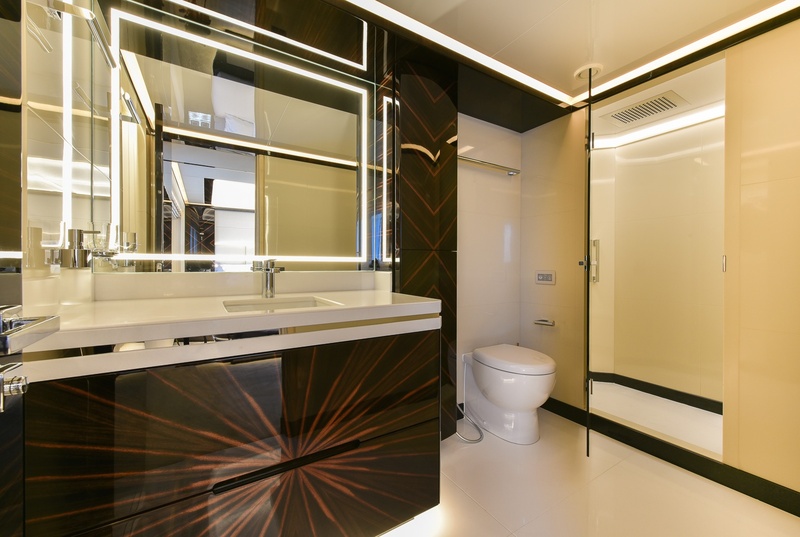 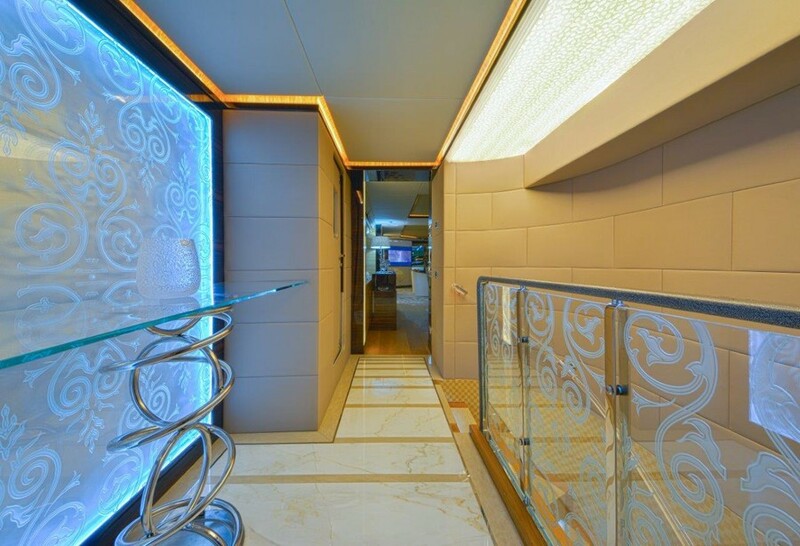 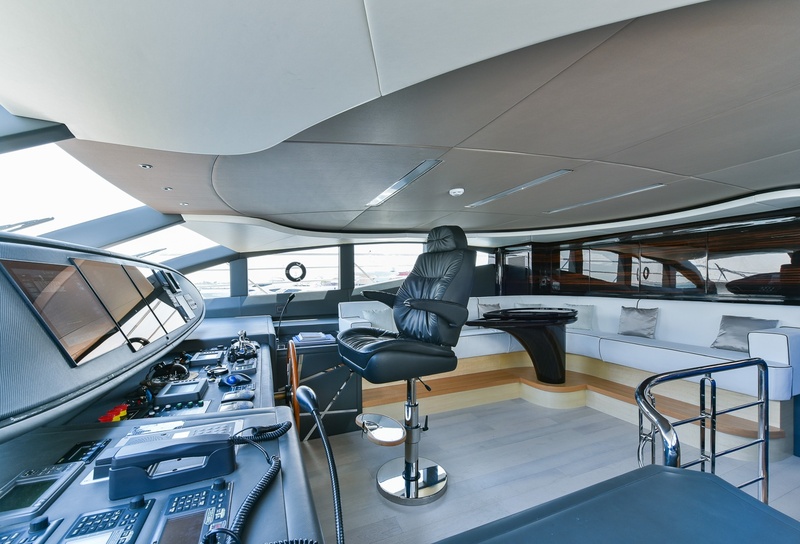 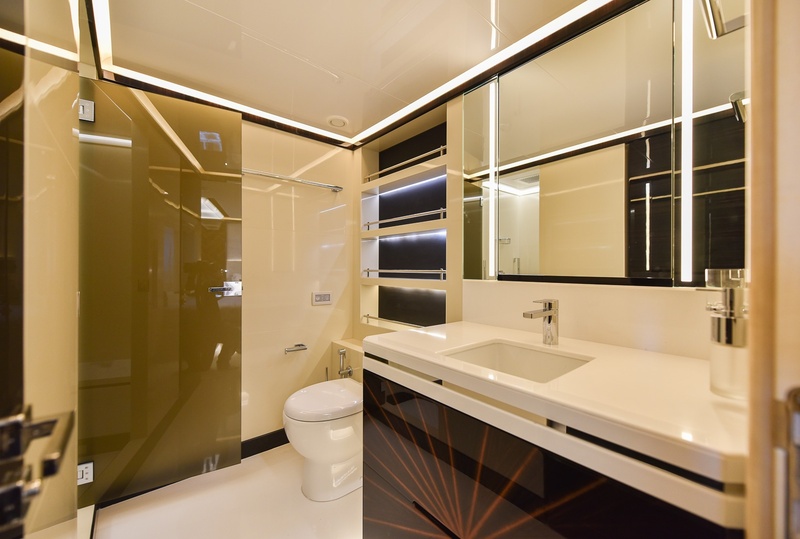 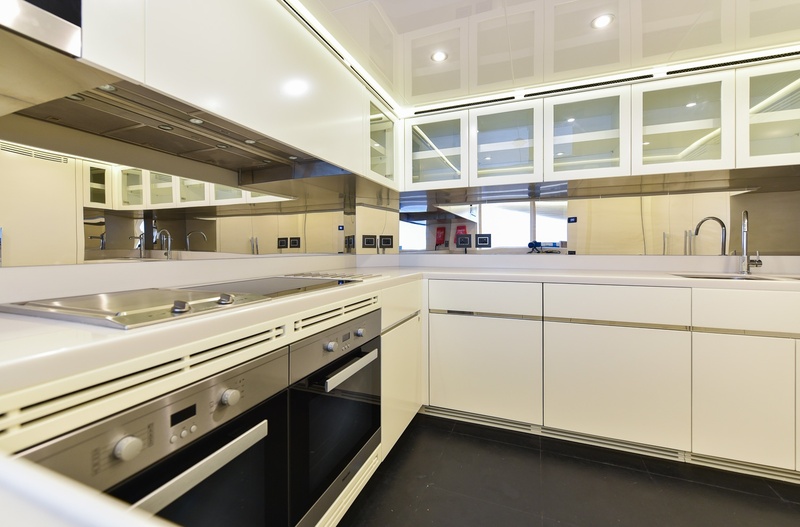 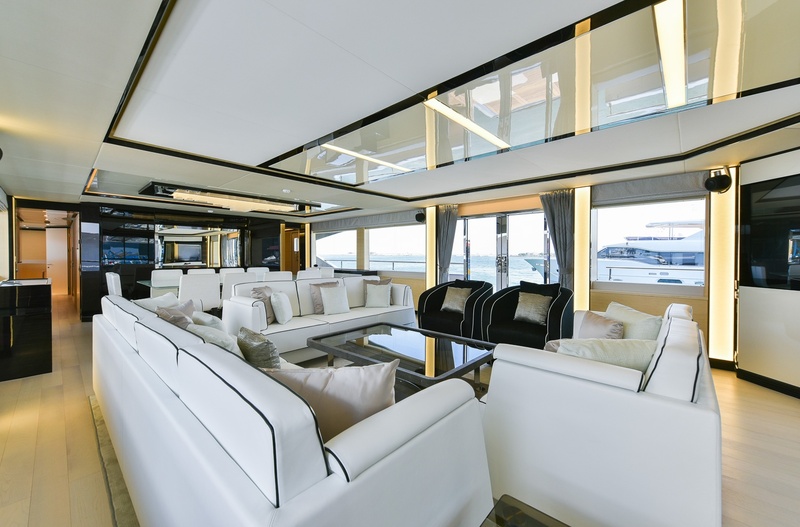 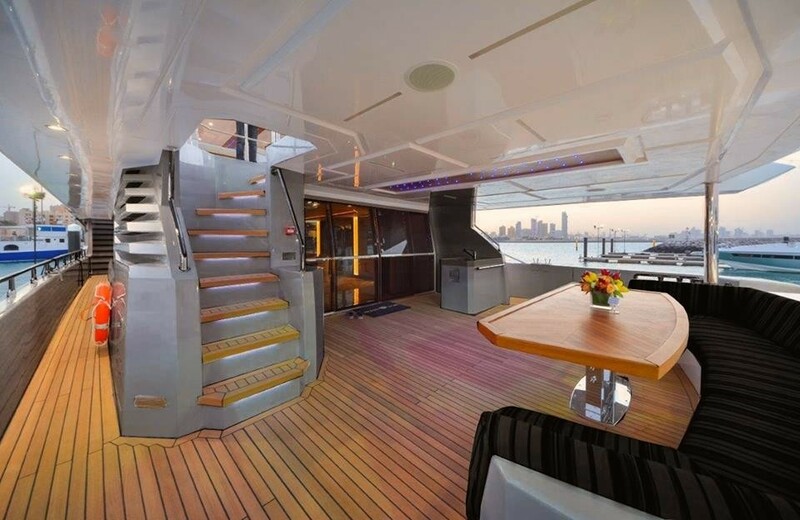 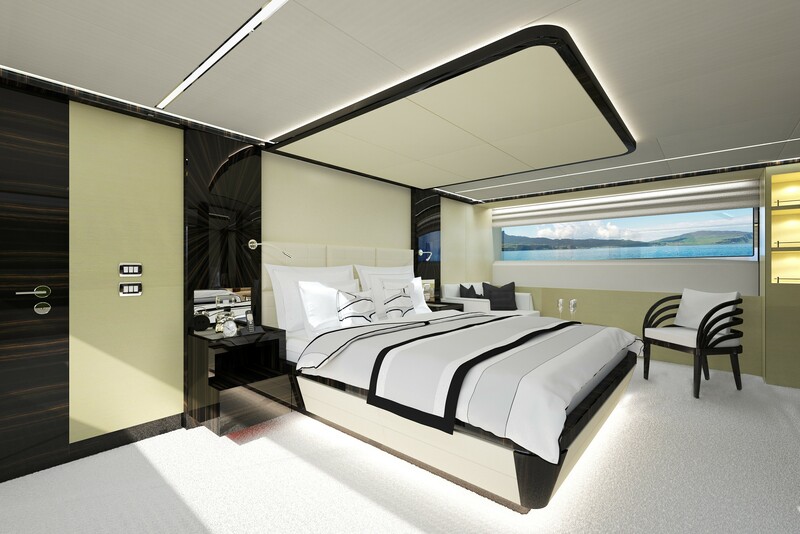 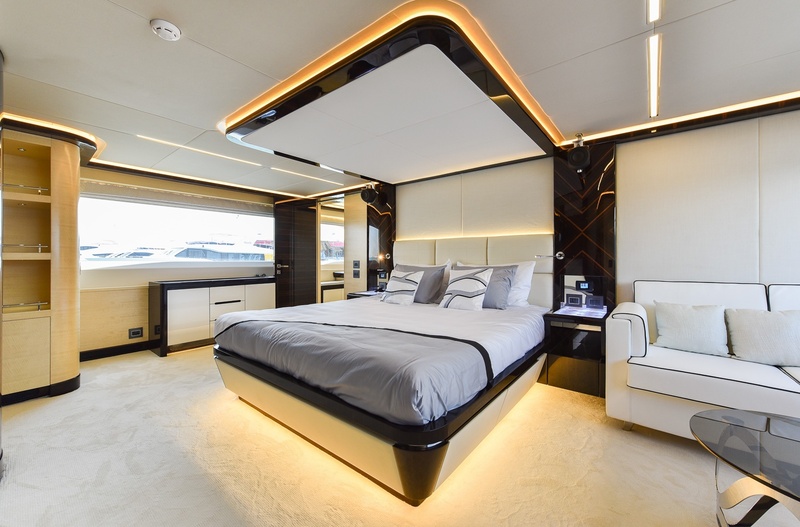 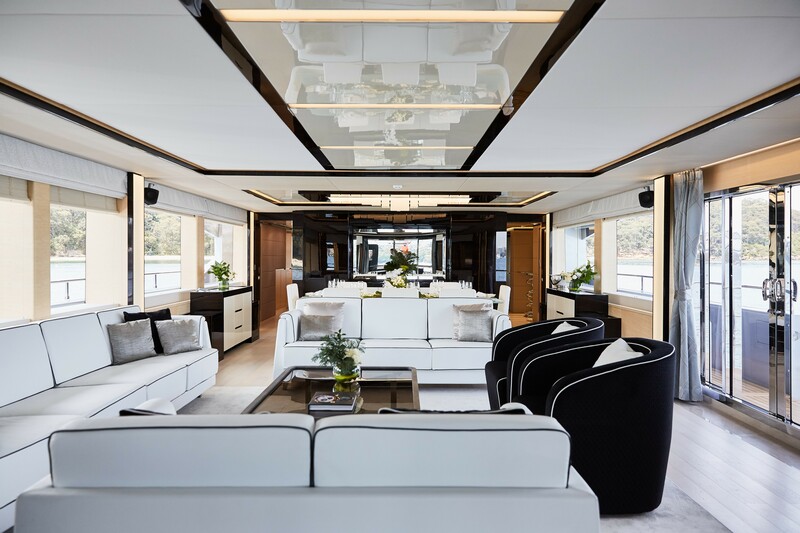 The interiors aboard the yacht are contemporary chic. 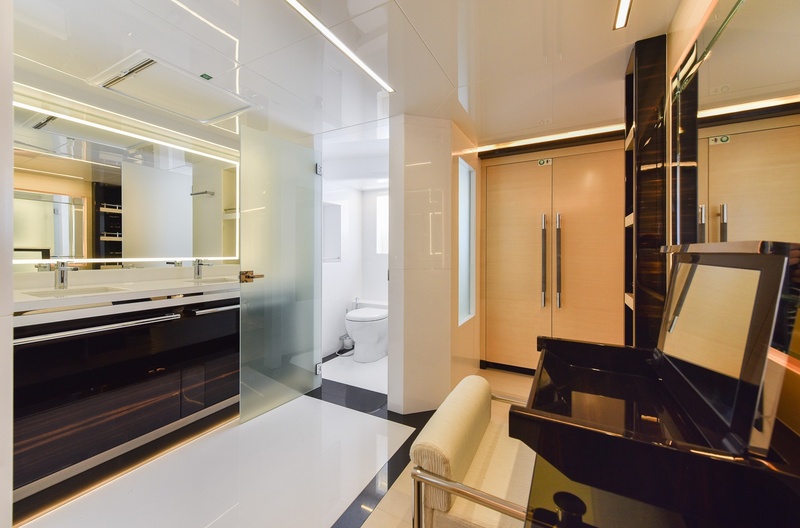 In the salon, the use of timeless black and whites paired with pale woods, create a clean and minimalistic feel. 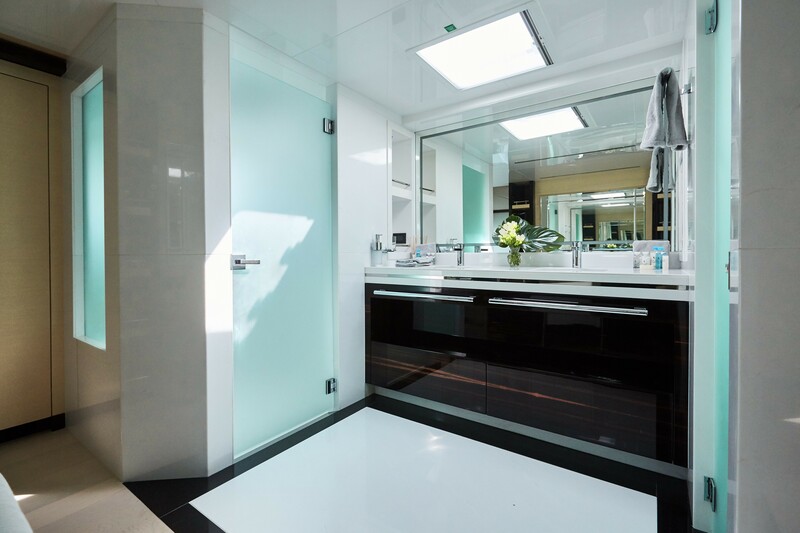 Soft furnishings are an eye catching white with black piping and black with white piping. 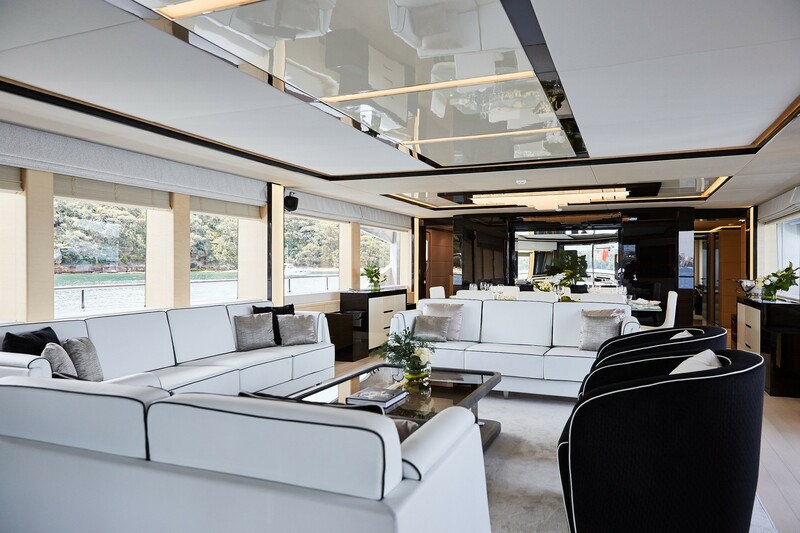 Centered in the salon lounge is a glass coffee table, featuring stingray leather edging, while forward is the open plan formal dining. 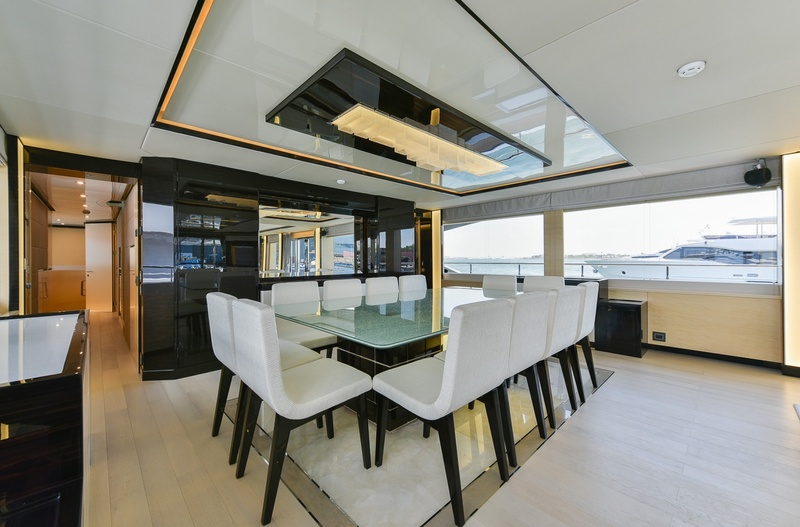 Her main salon table is made of 3 layers of crushed glass. 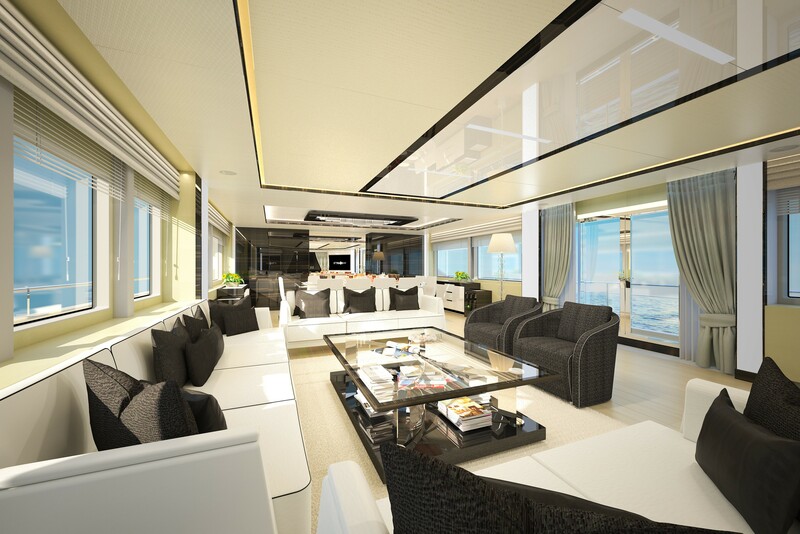 The entire salon is surrounded in large panoramic windows, optimizing natural light and offering spectacular views. 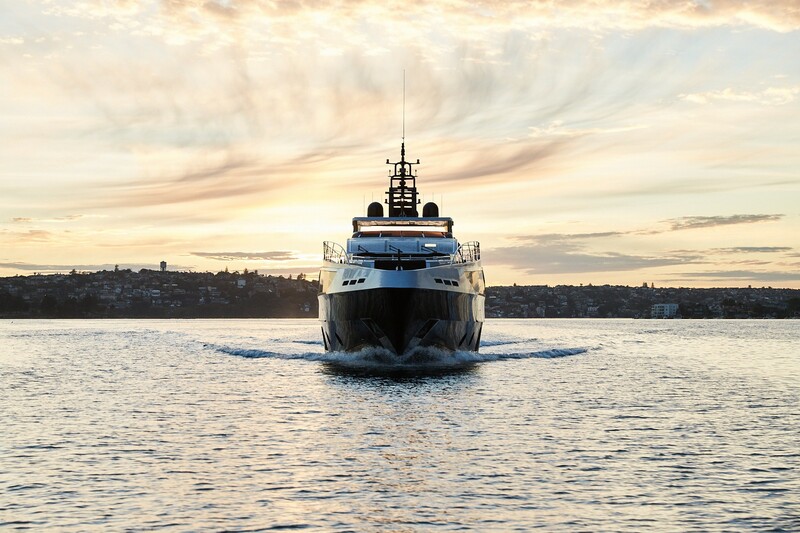 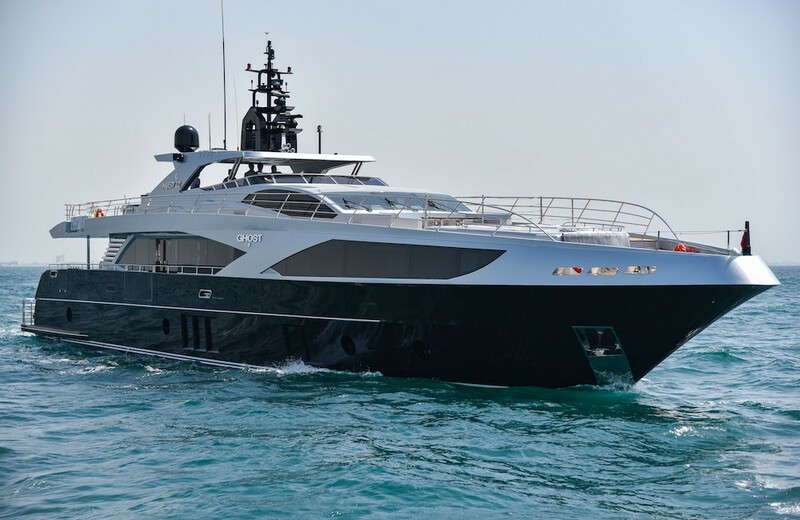 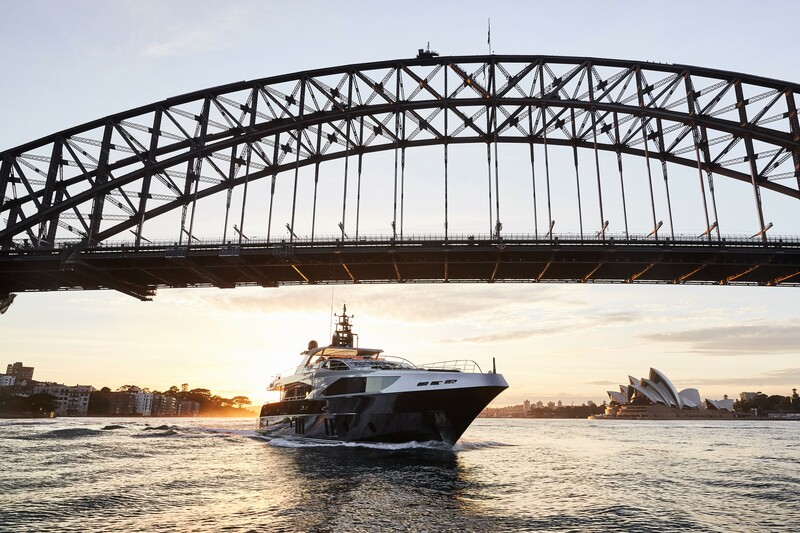 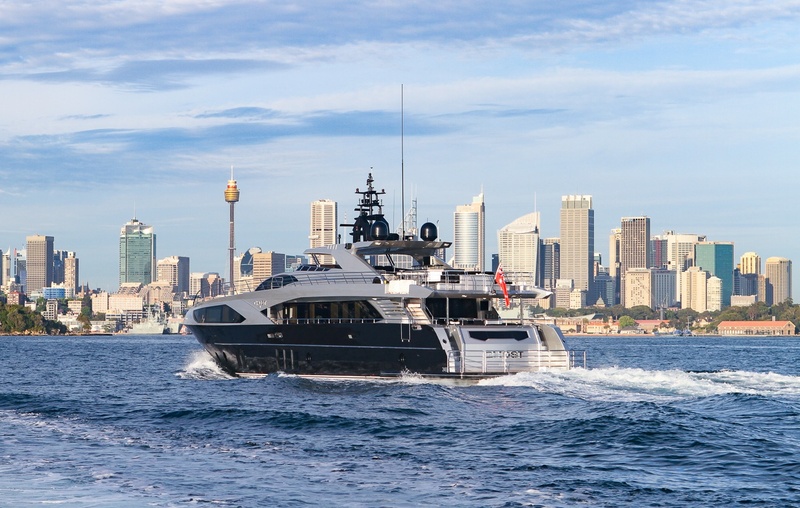 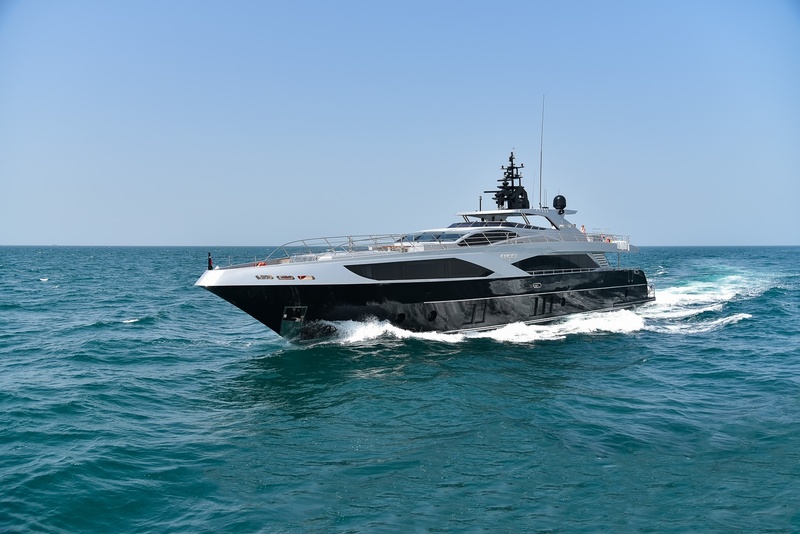 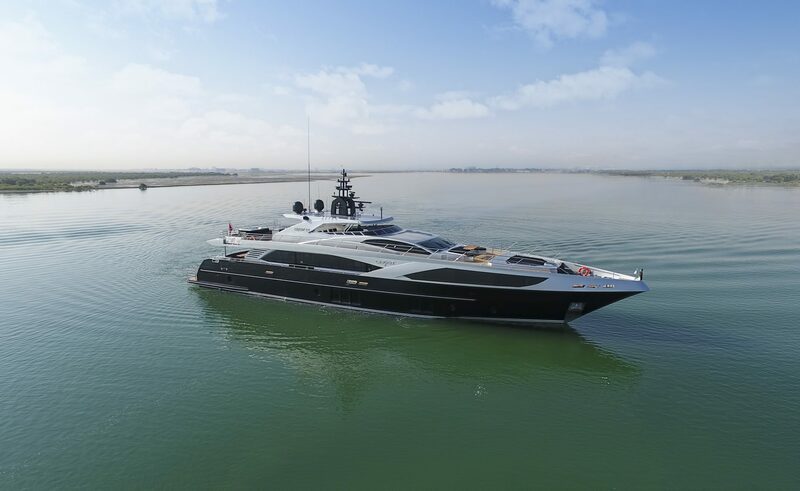 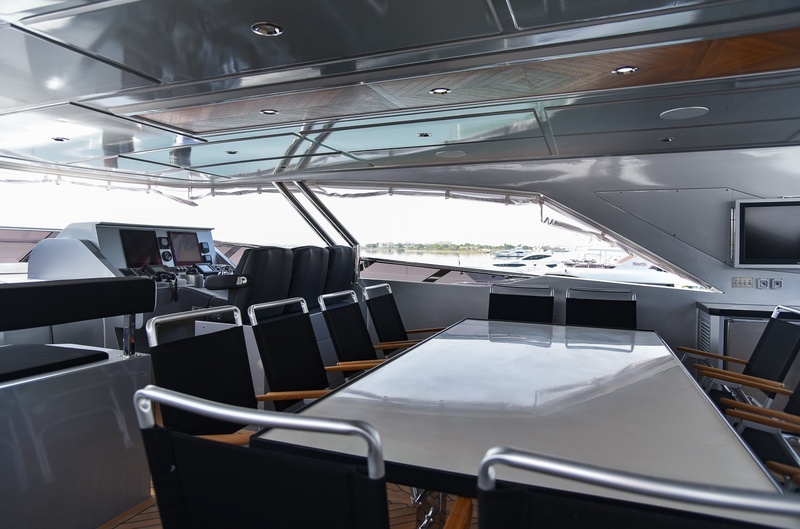 To starboard there are sliding glass doors leading directly to the side deck, with a fold out balcony over the ocean, as well as aft sliding doors for access to the generous aft deck. 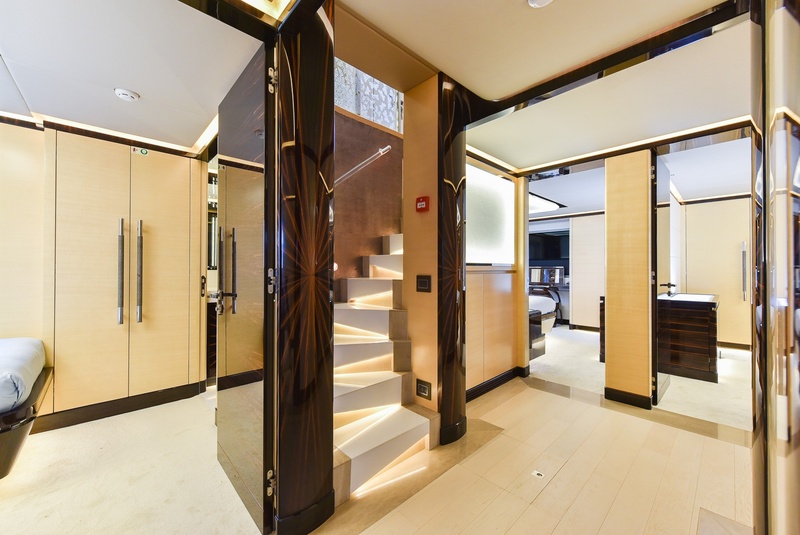 Accommodation is in 5 well-appointed cabins, with the master on the main deck forward and full beam, while a further 4 cabins are on the lower deck. 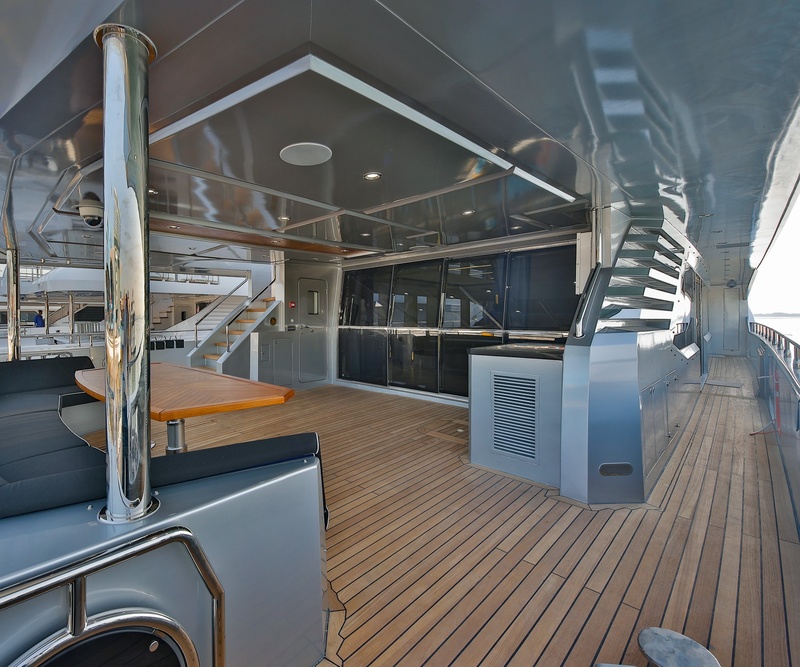 The exterior living is laid over two levels. 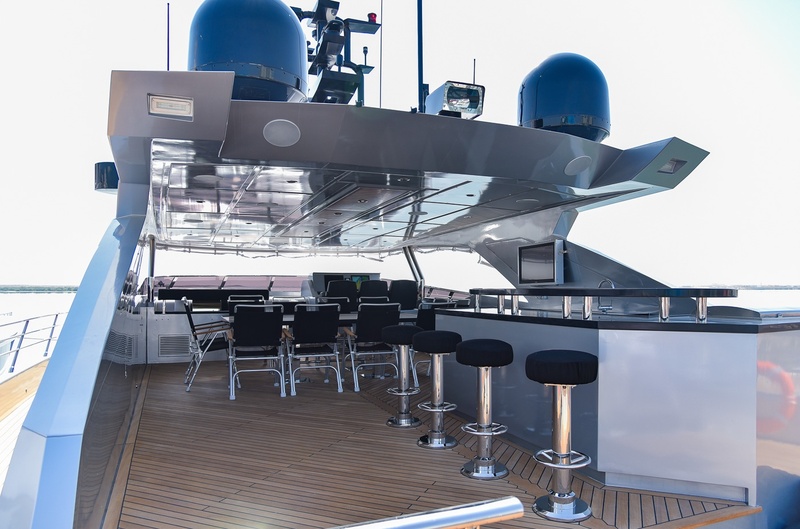 Adjacent to the salon is the shaded aft deck and alfresco dining option, perfect for socializing and entertaining. 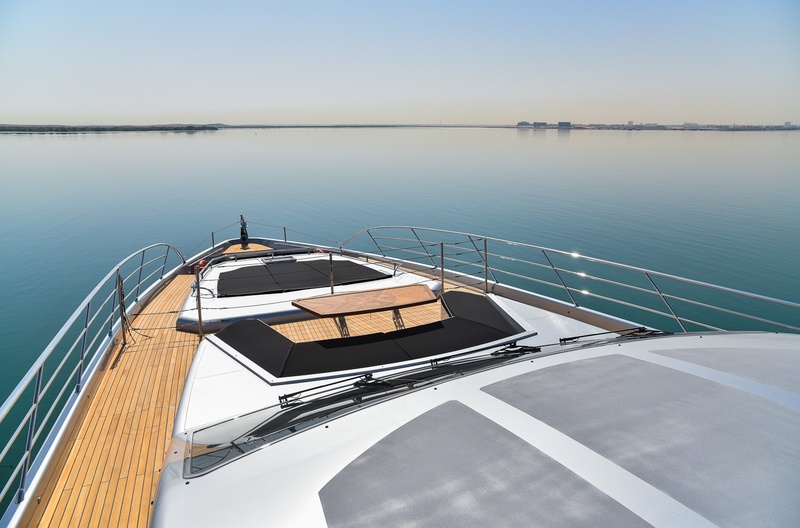 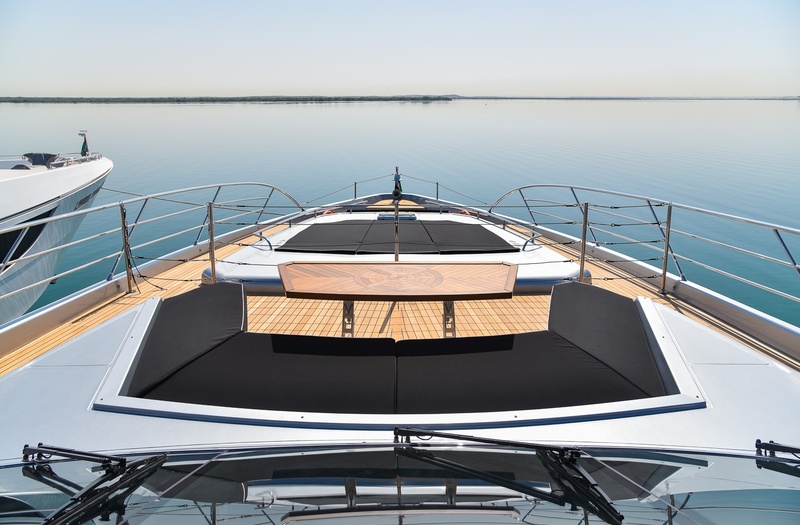 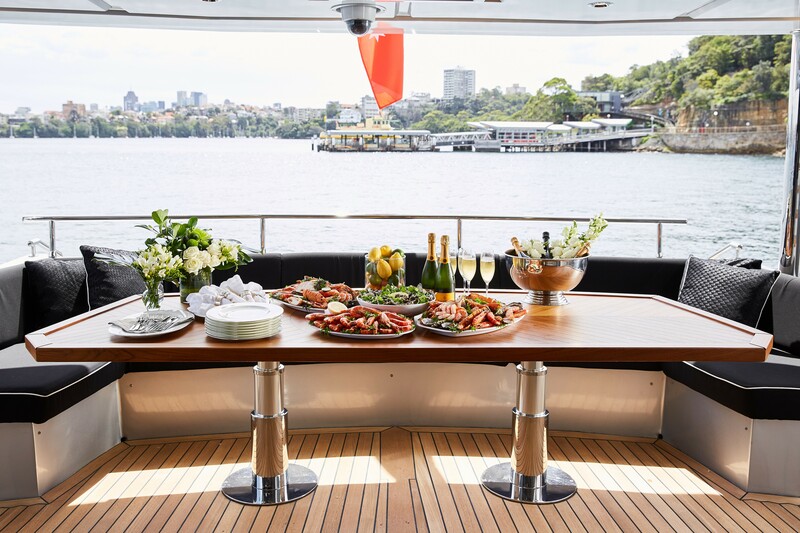 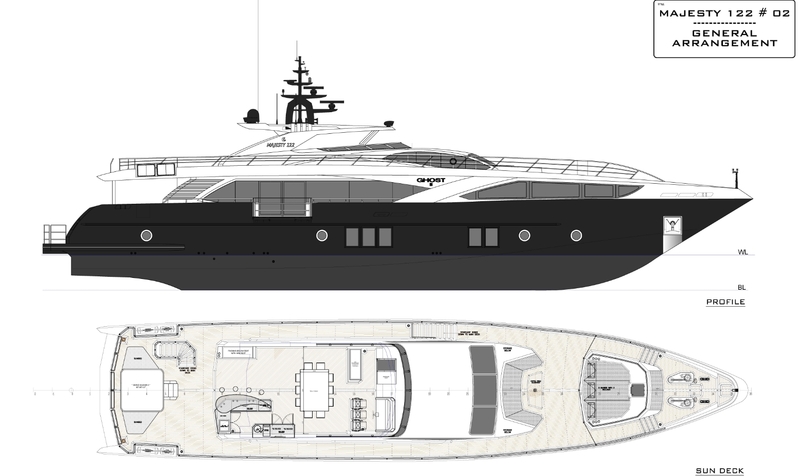 The foredeck offers a further alfresco dining table and plenty of space to soak up the sun. 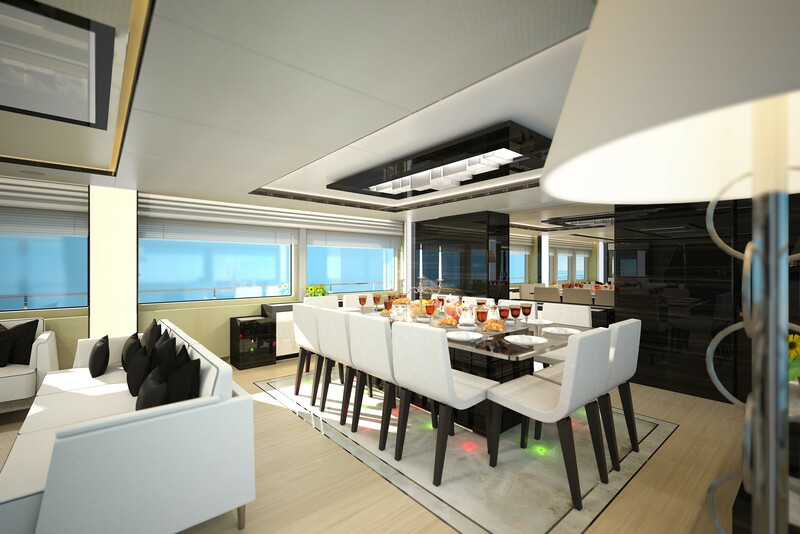 On the sundeck, guests can enjoy yet another alfresco dining option, have a refreshing cocktail at the wet bar and sun in style. 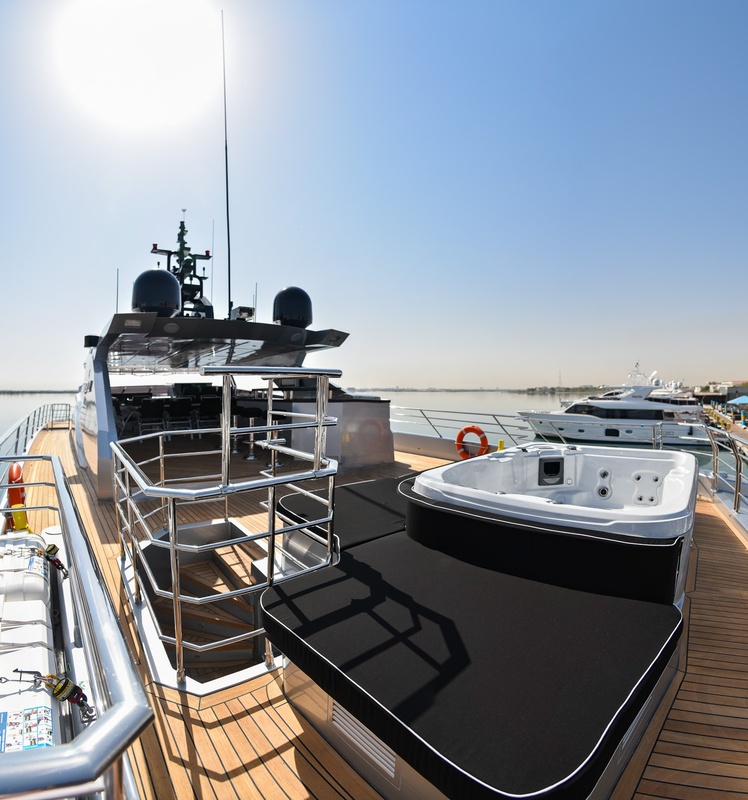 The sundeck boasts a luxurious Jacuzzi tub, surrounded by generous sun pads. 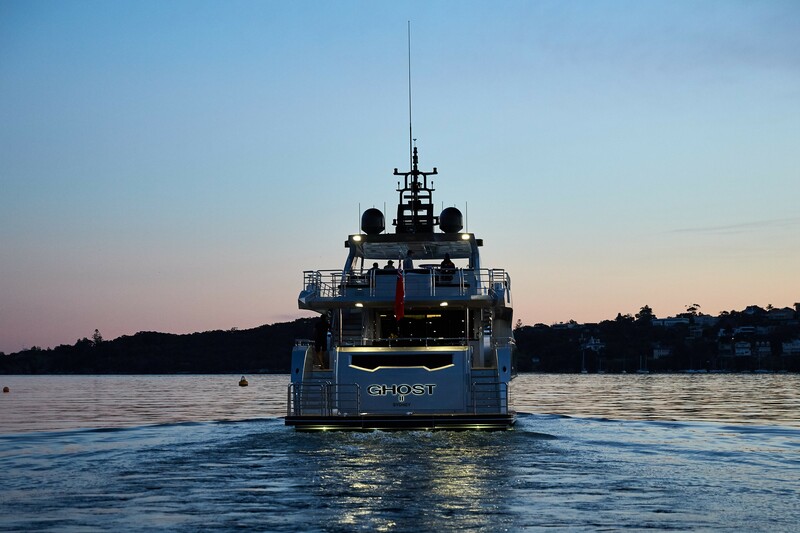 For the active water enthusiasts, GHOST II has an extended swim platform, with stainless railings for added safety. 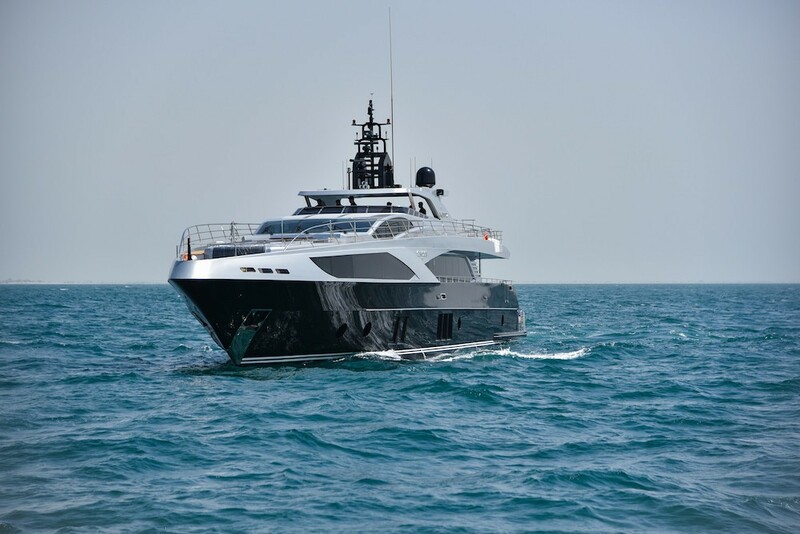 Auxiliary power is provided by 2 x CAT C32 Acert engines with 1,925hp, enabling 12 – 20 knots. 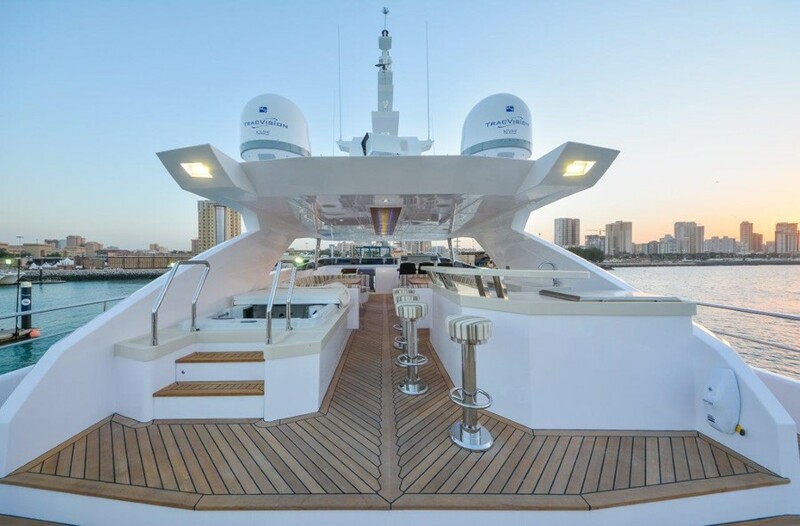 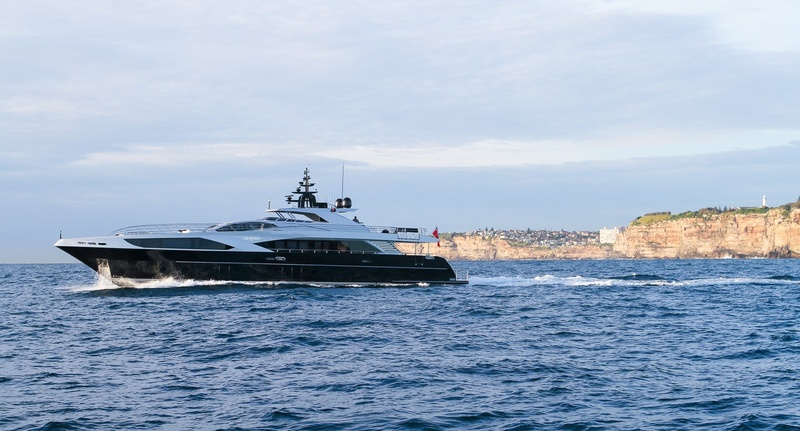 The yacht features both at anchor and underway stabilizers. 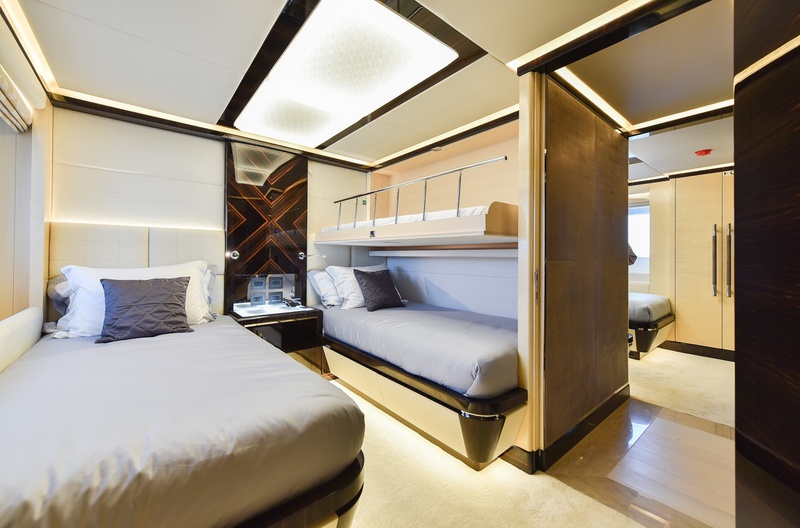 Accommodation is in 5 cabins, each of which offer private ensuite facilities. 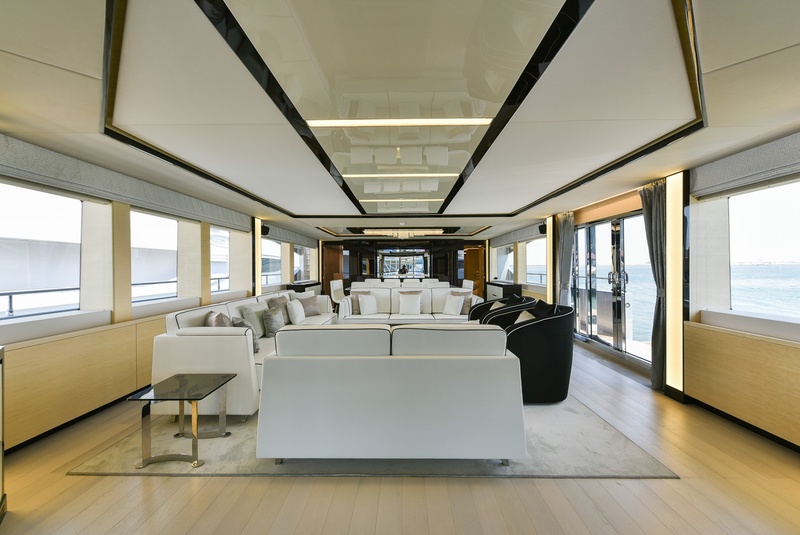 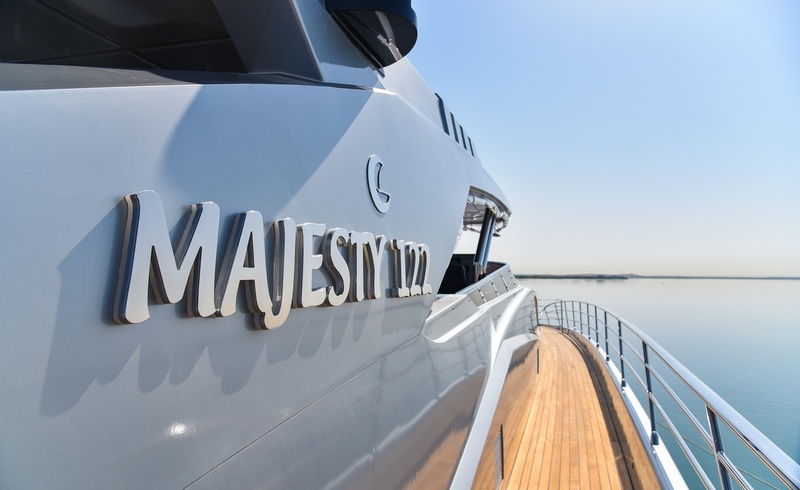 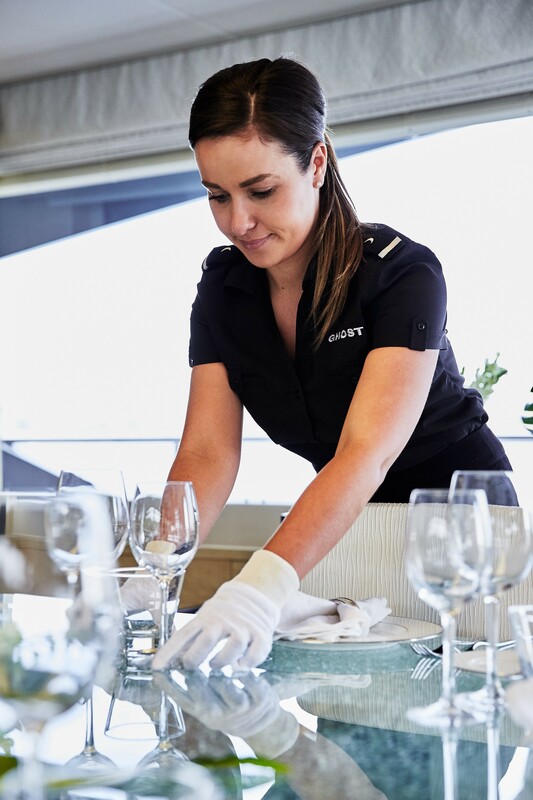 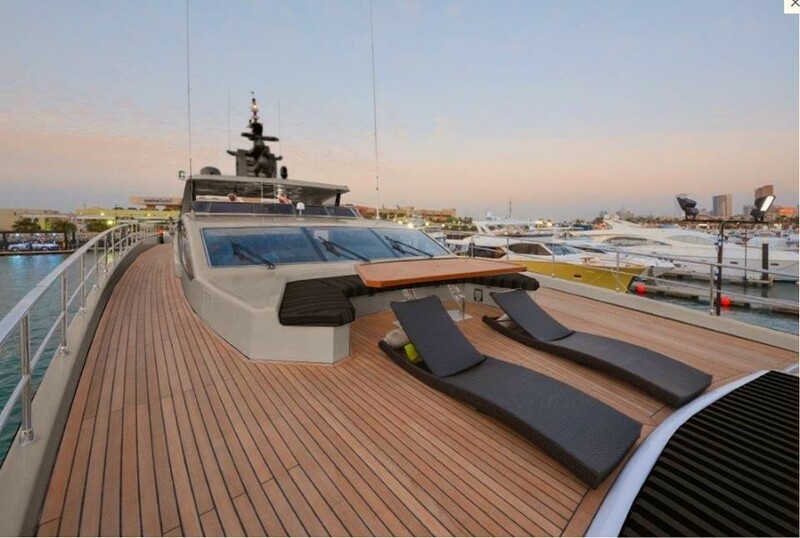 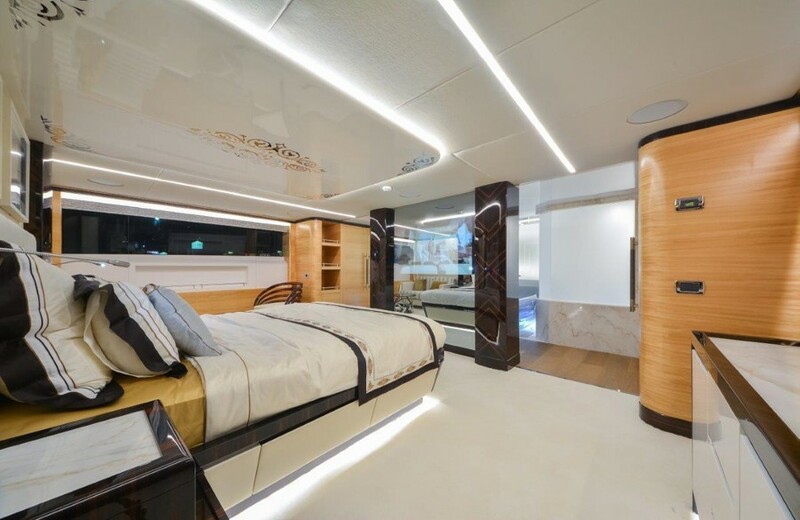 On the main deck is the master cabin, forward and full beam of the yacht, with a center lined king size bed, walk in wardrobe, powder room and owners office upon entrance. 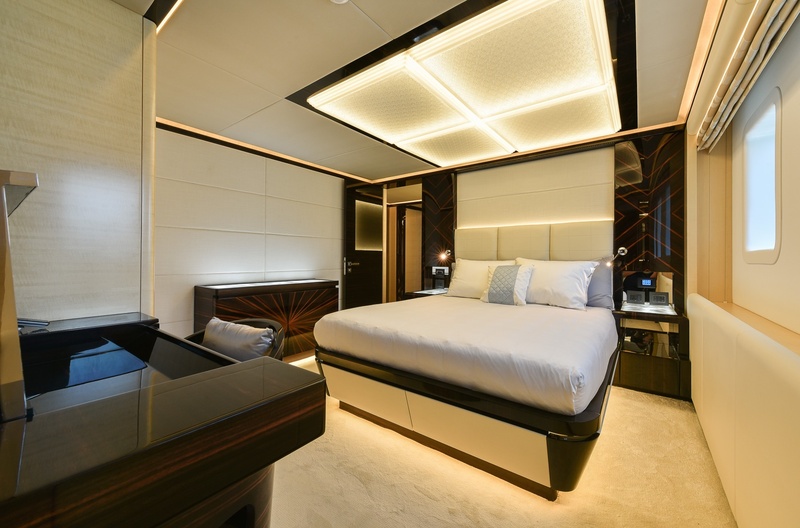 Additional accommodation is on the lower deck, with 2 cabins featuring queen size beds and 2 cabins with side by side twin beds. 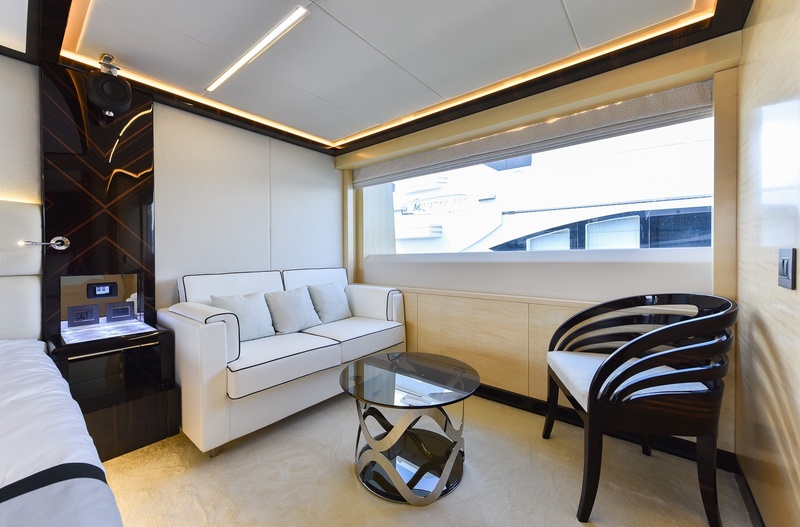 Two Pullman berths are available for up to 12 guests.